All photos are Copyrighted by Peter Goddard unless otherwise stated. The photographs within this collection have been very kindly supplied by Lynda Goddard of Montreal, Canada. The first three photographs were taken on board RMS Ascania in 1951 as the ship sailed from Liverpool to Montreal. 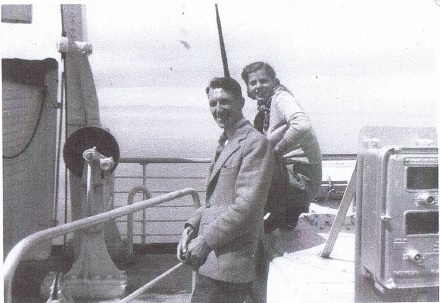 At the time Peter Goddard, (Lynda’s Father) was 18 years old and is seen here in the first two photographs, on the promenade deck of the Ascania. 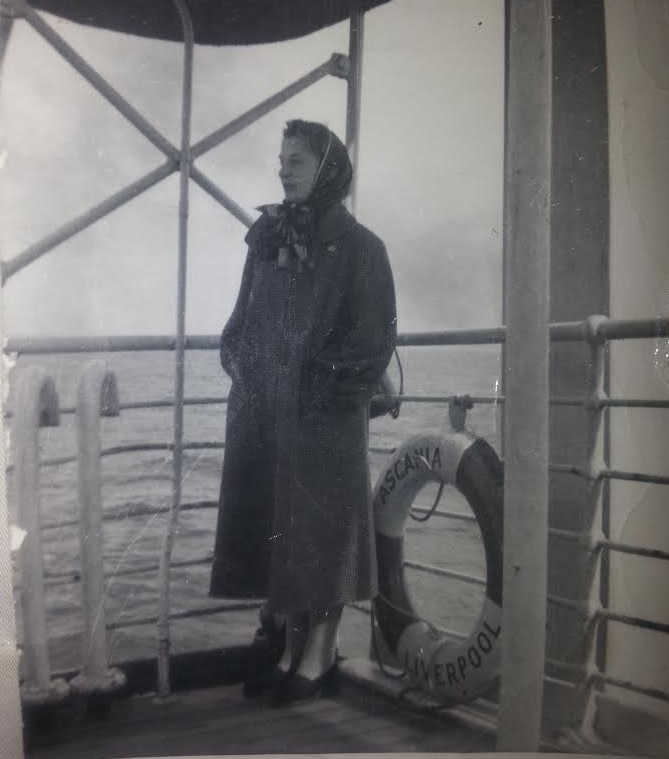 On the 5th October 1956, Winifred Goddard (Lynda’s Grandmother) also travelled on board RMS Ascania when she sailed from Southampton to Montreal, leaving Britain to join her sons in Canada. 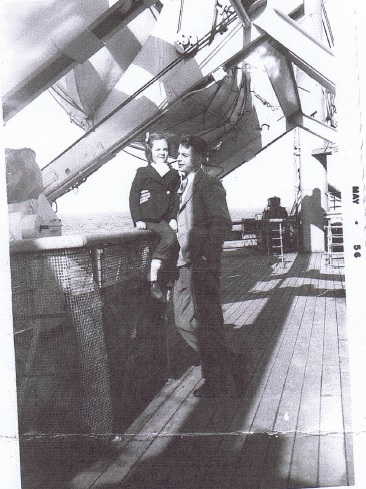 She is seen here on the boat deck of Ascania in this very poignant photograph and one that could be dedicated to the majority of immigrants who brought tickets to travel on board RMS Ascania or her sister ships. It should be remembered that like Winifred Goddard, these were not cruise ships, but a means of transport, taking them from everything that they had known in Britain, to a new life in Canada. Peter Goddard is seen here in July 2016 on a visit to the Canadian Museum of Immigration, at Pier 21 in Halifax, Nova Scotia (Pier 21 was where immigrants to Canada first arrived). 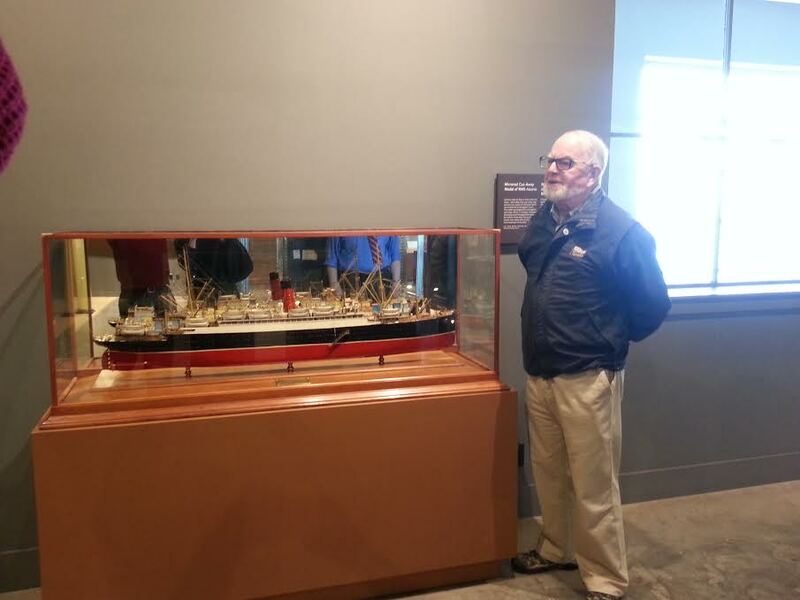 A new addition to the museum’s collection is the recently refurbished cut away model of the Ascania. The model was brought by the museum in April 2010 and is built to a scale of 1/10 inch = 1 foot. The starboard side of the model is complete but the port side is cut-a-way and illustrated with the cross section of the ship. The cut-a-way shows the location of rooms such as the food and supply stores, boiler room, engine room, crews quarters, 1st and 2nd class accommodations, grand staircase, dining rooms, lounges, men’s smoking room and women’s drawing room, captain’s and officers’ quarters. 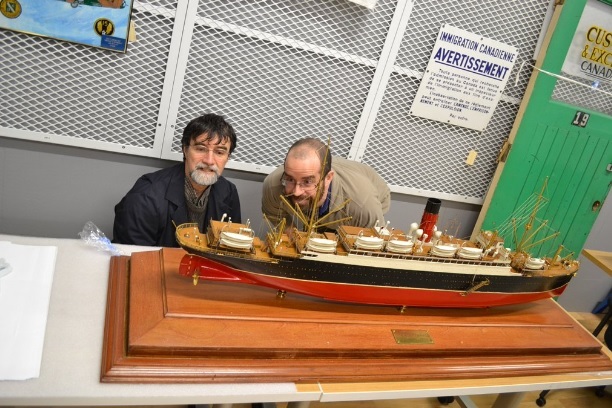 The Canadian Museum of Immigration curator, Dan Conlin (on the left) is seen here examining the recently refurbished model of the Ascania. 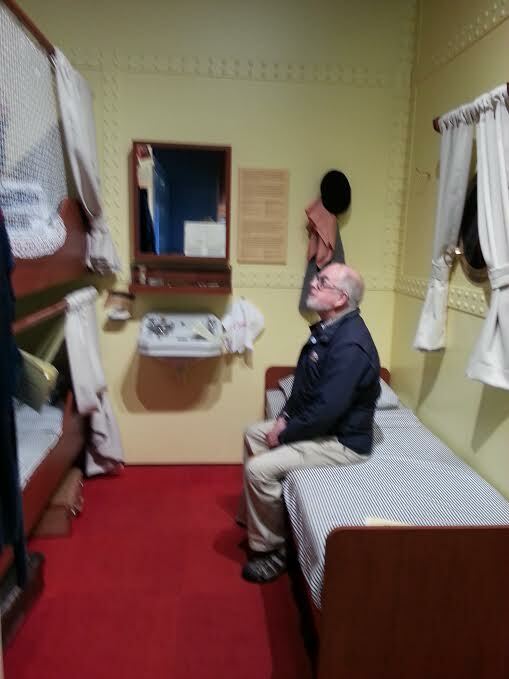 One of the highlights of the museum’s new Pier 21 exhibition is a re-creation of RMS Ascania’s cabin and dining room where visitors can walk right in. 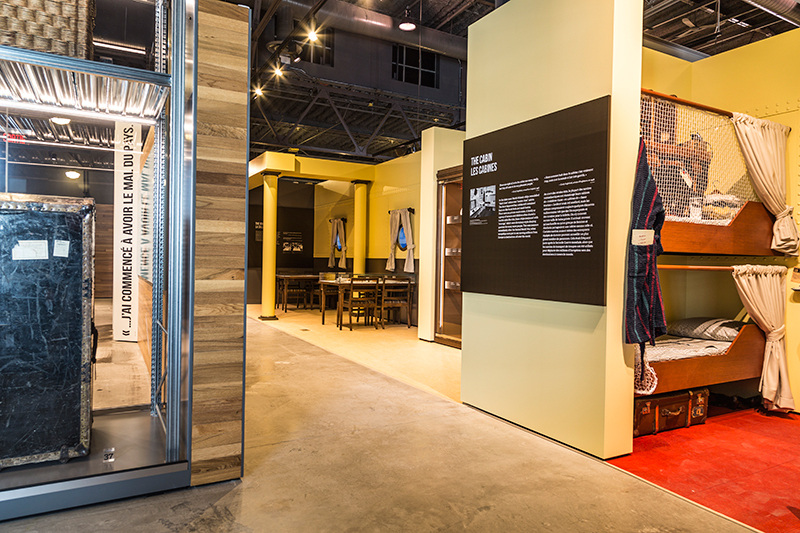 The museums cabin aims to capture the experience of an immigrant family in the early 1950s, the peak years of arrivals at Pier 21. Capturing the physical space of the cabin gives the visitor a snapshot of an immigration experience as for most of Canada’s history, an ocean voyage was a key part of coming to Canada. This varied in time from the deadly overcrowded “coffin ships” in the 1840s to the biggest and most luxurious ocean liners in the world in the 1960s. Ships of all sizes came to Pier 21 but the most common immigration ships, were medium-sized liners and typical of this type of liner, was the Cunard Line’s RMS Ascania with over 220 voyages on record. Deck plans and cabin interiors from Ascania were used for the reconstruction. 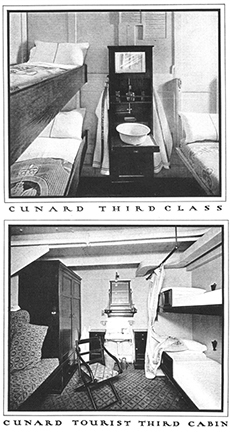 Ship cabins in the 1940s and 50s were a far cry from the luxury cruise ship cabins found afloat today, but they had also changed from the austere steerage quarters from the Titanic era in the early 1900s. In that era, hundreds of immigrants shared giant, open steerage decks or tiny steel cabins dominated by stacks of bunks and bare bulkheads. Ocean liner companies had started to upgrade their third class cabins in the 1920s as Canada and the United States began to restrict immigration numbers. Third class travel fell even further during the Great Depression in the 1930s. Faced with many empty third class cabins, shipping companies cut the number of beds and added nicer furniture, lively fabrics and modest decoration to entice budget travellers. They called these new cabins tourist class. While some families had the money to immigrate to Canada in first or second class, most immigrants sought the most economical way across. When immigration took off after the Second World War, tourist cabins were the most common form of accommodation on the Atlantic. They were still cramped and most often lacked portholes and there were no private bathrooms, so each cabin featured a sink for washing up. 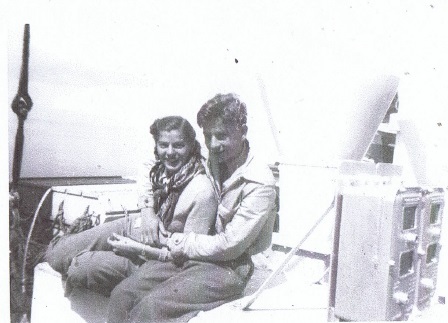 Sometimes a whole family occupied a cabin with several bunk beds but many ships separated male and female cabins. Mother and daughters would have one cabin with father and sons quartered on another deck. Still, curtains and attractive furniture added a bit of style and comfort, an improvement on the austere crossings of earlier immigrants. Immigrants in tourist cabins were the lucky ones. Some people in the late 1940s crossed in converted wartime troopships pressed into service to handle the large numbers of post war immigrants. These ships, often named after American army generals, featured open dormitory decks with row on row of bunks, a throwback to the old steerage quarters of the early 20th century. The reconstructed cabin recreates this unique space in tourist class that provided a home between homes, for many immigrants. It is furnished with period luggage and some discrete artefact cases, presenting household items that passengers took with them into the cabins for the voyage. An ambient sound track with snippets from related oral histories, along with sounds like the regular thump of steam engines and ocean noises, also adds to the illusion. Peter Goddard is seen here in July 2016 in the Pier 21 re-creation of RMS Ascania’s cabin.